Marcella Ernst, 98, of Schuyler, died Thursday, January 18, 2018, at the Schuyler Care and Rehabilitation Center in Schuyler. 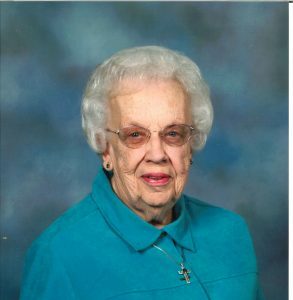 Funeral Service Thursday, January 25, 2018, 10:30 A.M.
Marcella was born April 10, 1919, near Schuyler, Nebraska to Arthur and Hallie Dell (Sigler) Huhn. Following High School, Marcella earned a Teaching Certificate and taught school for two years. The family moved to California where Marcella and Melvin Ernst were married on December 9, 1938. Melvin brought Marcella "back to Schuyler" and they lived and farmed northwest of Schuyler. Melvin died in 1970 and she moved to town in 1971. Marcella worked at the Top Notch Café for many years, was a great seamstress, making all the clothes for her family, and enjoyed bowling with Melvin. She was very proud of her African Violets and Geraniums and whenever Melvin made films of the family, they began and ended with pictures of her flowers. Marcella was a member of Trinity Lutheran Church and the Ladies Aid. Surviving is her daughter, Elaine(James) Williams of Bellevue, son Allen (Kak) Ernst of Schuyler, a sister, Alice Pilgram of Chula Vista, California, sister-in-law Particia Huhn of Denver, 7 grandchildren, 14 great-grandchildren, 1 great-great grandchild, daughter-in-law Maribeth Ernst of Idaho and many nieces and nephews. She was preceded in death by her parents, Arthur and Hallie Huhn, step-mother Marie Huhn, husband Melvin, two daughters; Nancy DeBaets and Anita Ernst, one son Randall Ernst, a sister Genelle Waak and brother, Leland Huhn.